On Friday I reported to you about the nice Laughing Raven Barbera that was received as a sample from My Wines Direct, and here's my report about the other bottle they sent me. Unlike the Laughing Raven, there are more tasting notes about Mill Creek on Cellar Tracker, including notes about this particular wine. It's listed for $17.99 on the My Wines Direct web site, while the average purchase price for all bottles registered on Cellar Tracker is $19.57. The first thing I noticed about this wine was how smooth and rich it was. There was lots of plum and berry fruit on the palate with balanced acidity and tannins. The acidity kept the ripe fruit from being flabby. This one tasted like a Merlot, not the type made famous by Miles in the movie Sideways, but like a Merlot ought to taste (at least to me). The rich fruit and smooth texture dominated but it didn't get tiring to drink. Comparing this to Friday's Barbera, I would go for the Barbera, however. That one was more complex. 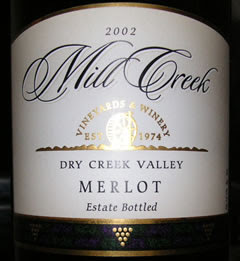 This Merlot makes for easy drinking but is more straightforward. This is a nicely made wine that's ready to drink and it gets two thumbs up. Here's my matching YouTube video for this wine. Click here if you don't see it below. Sigh.. I must be getting old. I don't know who 80% of the women are that are in the video!